A magical mix of dance, text, visuals and sound, Chotto Desh is a hit with audiences and critics alike. Join Springboard Performance, StoryBook Theatre, and the Taylor Center for the Performing Arts for this special performance. Fusing dance, storytelling, interactive animation, and specially composed music, Chotto Desh is a bewitching, family-friendly tale of a young man’s dreams and memories from Britain to Bangladesh. Created by Akram Khan, one of the UK’s most celebrated and influential artists, and reworked from his Olivier Award-winning autobiographical solo show Desh, Chotto Desh draws on Khan’s own childhood. Don’t miss this beautiful and intimate piece of storytelling that delivers a profound message about the memories we hold dear. 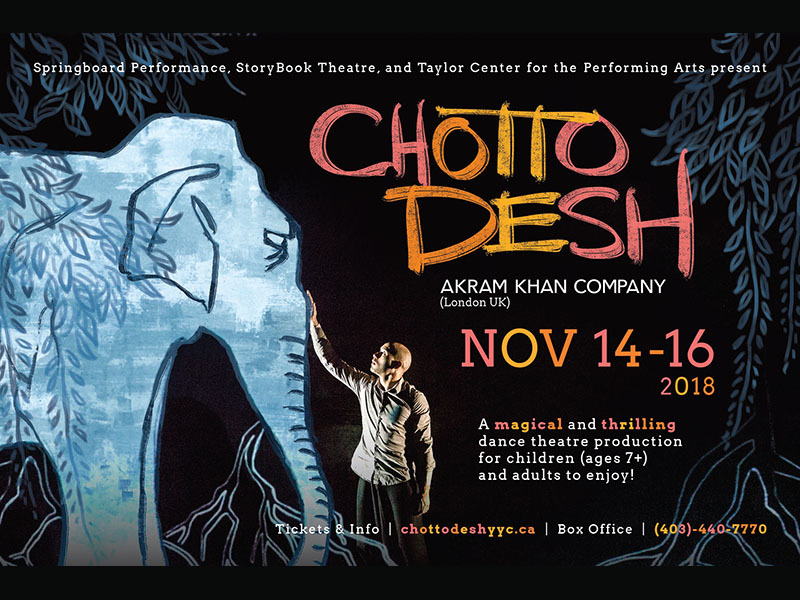 Chotto Desh runs November 14 to 16, 2018 at the Bella Concert Hall, Mount Royal University (18 Mount Royal Circle SW).